The recent floods in the central provinces from Thanh Hoa to Ha Tinh have left 28 people dead or missing, according to the National Committee for Search and Rescue. By 5pm on September 8, floods in Ninh Binh to Ha Tinh Provinces had left 28 people dead or missing. Of these, one death was reported in Ninh Binh, four in Thanh Hoa, five in Nghe An, two in Ha Tinh, and three in Thanh Hoa and Nghe An Provinces. In Thanh Hoa, Nghe An and Ha Tinh 13 people were reported injured. Heavy rains also caused water levels to rapidly rise in rivers, breaching parts of a dyke. Thousands of houses and hectares of crops have been destroyed and losses are estimated at thousands of billions of Vietnam dong. Local authorities are currently implementing urgent measures to cope with floods and ensure public safety. According to the Thanh Hoa provincial committee for flood and storm prevention, until September 7 widespread flash floods had killed five people in the region, swept away 100 houses, submerged nearly 2,400 houses and more than 20,000 hectares of rice and subsidiary crops, with losses estimated at nearly VND640 billion. The flood control committee said river water levels are receding and dykes are likely to be breached. Meanwhile forces have been mobilized round-the-clock and asked to prepare necessary equipment to deal with any emergencies. Four people in Nghe An Province are reported dead or missing and homes and crops have been destroyed after the flooding and heavy rains. Floods and thunderstorms killed two in Ha Tinh Province and inundated around 1,500 houses and 820 hectares of crops. Ha Tinh Province allowed pupils in inundated districts to stay at home from school and is now working on dealing with the consequences of the flooding. The National Steering Committee for Flood and Storm Prevention and Control has asked these provinces to closely monitor the water levels of rivers and take measures to cope with flash floods and landslides. 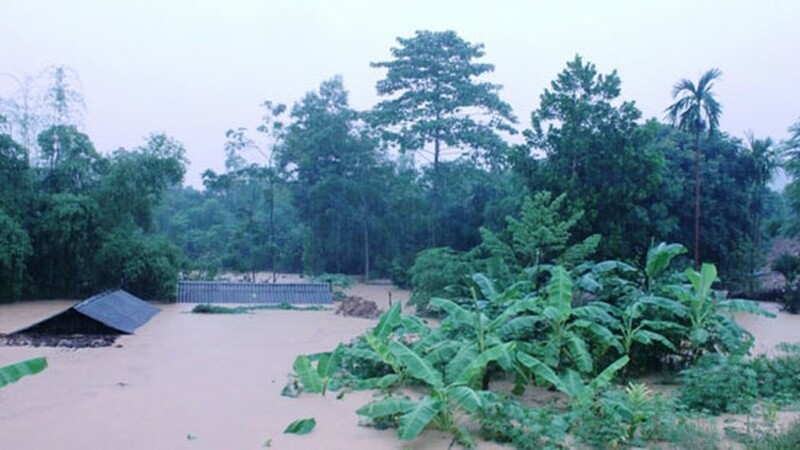 On September 8, the People's Committee of Quang Loc Commune in Quang Trach District in Quang Binh Province reported that flood waters from the Gianh River unexpectedly broke a wooden bridge over the Con Se River. The 300m long bridge was then swept away with 10 people on it. The local rescue team on duty at both ends of the Con Se Bridge dived into the river and rescued all 10 people, eight adults and two children. Meanwhile, the People's Committee of Tuyen Hoa District in Quang Binh Province said the floodwaters have inundated thousands of hectares of summer-autumn rice crop in the district, causing losses of upto VND20 billion.